There are now ten contestants left standing in the O.D Brisbane Smirnoff Ice Annual Karaoke Competition. The finalists are five females; Ticoya Henry, Mareice Roberts, Petrula Clarke, Cordella Gilbert and Renetta Boyd while the five males are Dominic Matthew, Jermaine Camron a.k.a. CJ, Rally Bartlette, Mauriece Flanders a.k.a. E.K and Davey Wigley a.k.a. Biggers. The competition was held at the BET Soundstage on Tuesday November 1, and was well attended as usual. This time each contestant had to perform two songs of their choice that were not the same musical range. Ticoya Henry stood out in the first round, Cordella was also consistent as well as Mareice. The show was peppered with some interesting moments. For example Lauryn who sang in the first round, “Call The Man” sang “My love is your love” in the second round. She apparently sang the words too fast and got mixed up then demanded the controller of the music to start the song over again. However, the judges would not allow her to continue as she should have in the first place, according to one of the judges Larry Vaughn, where she then stormed off the stage as the next contestant came on to sing. Starting off the males was Rally Bartlette who became as animated as he possibly can onstage. Everyone was ready and excited to hear what he would come with. But were they really ready for the gimmicks and expressions he would bring? Some people almost fell out of their seats laughing, Rally sang “I believe I can fly” and did actions to show he was flying, doing moves that “cracked” everyone up. 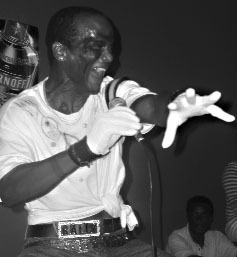 He did not go easy on the crowd in the second round either, as he came all out with the song “Thriller” with an impression of the king of pop, Michael Jackson. Dressed in white gloves, black shoes and white socks, suspenders complimented with a whole lot of moon-walking, Rally moon-walked straight into our hearts and the finals. It was no surprise CJ made it to the finals, he has no problem hitting the high notes, any voice cracking, and everything was perfect. However his second song, “Thong Song” by Sisqo, was not a very good choice as it did not come off well in the end. According to Shervin White it is going to be between Davey and E.K in the male round. “I think it’s between Davey and E.K, Davey sings with feelings and he chooses good songs. E.K was good and I think he could have done a little better but I think it’s going to be out of the two of them,” said Shervin. Randy also agrees with Shervin. “For the males, it’s either Biggers or E.K but the guys are really extraordinary in the competition they are running things… for the females it’s going to be Cordella, that girl can sing, she’s great,” he said. However, Empress feels strongly that CJ will win hands down. “He has the perfect voice and chooses the best songs and I think Ticoya will shine in the finals, she chooses songs that goes with her voice,” she said. Jay disagrees and believes that Mariece is going to win because she has the best voice in his opinion and stage performance.